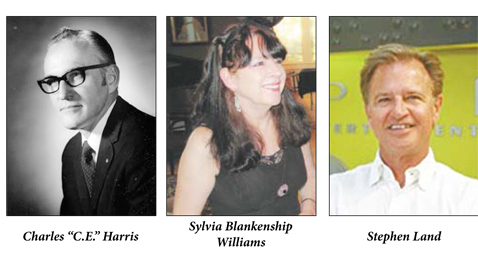 The Central High School Foundation and the CHS Alumni Association are proud to honor three distinguished alumni as additions to the Central “Wall of Fame.” This year’s honorees are: Charles “C.E.” Harris, Class of 1935 (d. 2005); Sylvia Blankenship Williams, Class of 1970; and Stephen Land, Class of 1971. Charles Edgar Harris began his very successful career with the H.T. Hackney Co. in 1945, when he was employed by Ben Morton and his son Julian, who managed the company in succession from 1899 to 1971. C.E. Harris became the chief executive in 1975. He also served on the board of directors of both the Park National and the First American Bank, was a long-time member of the Downtown Rotary Club, the Downtown Knoxville Association, the Greater Smoky Mountains Council of the Boy Scouts of America, the Knoxville Y.M.C.A. and the United Way. He was called upon by community leaders to lend his budget expertise to the planning for the 1982 World’s Fair, and established accounting methods and procedures which contributed to the success of the Fair. Additionally, he was a layman, deacon, Sunday school teacher, trustee and chairman of many committees of Central Baptist Church, Bearden. He has left an enduring legacy by the donation of his acreage and home on the corner of Morrell and Westland roads for the benefit of Baptist ministries. The Knox County Association of Baptists now maintains handsome offices on the premises, visiting missionaries are housed in the former residence, the community can picnic at the outdoor Harris pavilion and the Central Baptist soccer program uses the recreation field. He served two terms as a trustee of the Carson Newman College (now University) and was a director of Religious Heritage of America, St. Louis, Mo., receiving their Outstanding Community Leadership Award. Preceded in death in 2002 by his beloved wife of 64 years, Dorothy Wilson Harris, Charles Edgar Harris passed away on June 14, 2005 at 89 years of age. He was survived by his two sons, Charles Edgar “Ed” Harris Jr. and William “Bill” Harris, and by six grandchildren and 15 great-grandchildren. Sylvia Blankenship Williams is one of the creative forces responsible for the successful Fountain City Art Center. In 2001, Sylvia became involved with an area artist organization called Fountain City Art Guild and she proposed creating a non-profit art center. In October 2004, that dream was realized in the old Fountain City Library building on Hotel Avenue. Months before receiving keys to the property, Sylvia formed a board of 21 community leaders and artists and enrolled 150 Art Center members. Sylvia served as volunteer director from the beginning. Since 2005, when the board asked her to serve as executive director with a salary, she has proudly held that position. The art center offers numerous classes and workshops, exhibits, summer art camp classes for youth, 5 or 6 major art-related events, and works with other organizations in the region to promote the arts. Sylvia was the oldest of four children born to Dr. James L. Blankenship, a nuclear physicist, and Jamie Gillenwaters Blankenship. She attended Spring Hill Elementary and Fountain City Elementary before attending Central. She later received a degree in French Literature from Mary Baldwin College then a teaching certificate and M.A. in French from the University of Tennessee before entering education. She is married to another Central graduate, artist Charles Williams. She and husband Charles have two children, Chuck and Olivia, and two grandchildren. Sylvia has been described as a “study in contrasts”; small in stature but a whirlwind of ideas, energy, and enthusiasm. She is both a gifted artist and a marvel with public relations, making everyone she meets feel special and important and helping to make the Art Center an important asset to Fountain City. The third honoree, a 1971 graduate of Central High School, Stephen Land, has become nationally known as the founder and CEO of Jupiter Entertainment. Gov. Haslam recently appointed Land as one of four new commissioners on the Tennessee Music, Film and Entertainment Commission. The son of Ruth and Fred Land, Stephen and his sister Frieda grew up in Norwood, attending Fountain City Elementary, then Central. After graduation, he obtained a degree from the School of Journalism at the University of Tennessee. His communications degree lead to a unique opportunity to work for the Knoxville Chamber of Commerce where he held a number of positions, eventually serving as General Manager. “I was so fortunate to work for the Chamber during the World’s Fair. The atmosphere in the community was just electric.” While working at the Chamber, Land met Ross Bagwell who had been hired to produce several videos for the Chamber and formed a lifelong connection. Bagwell hired Land for Cinetel Productions, placing him in charge of creating shows and pitching them to networks. Over time, Land began to write, produce and oversee shows as well. In 1996, Stephen Land established his television production company, Jupiter Entertainment, to pursue his passion for storytelling through film. One of Land’s first projects was the hit series “City Confidential,” Jupiter has continued to produce prime-time series and specials for cable, the best known series include “Hey Dude” (Nickelodeon), “America’s Castles” (A&E), “Biography” (A&E), “Club Dance” (TNN), “Modern Marvels” (History), “Sons of Guns” (Discovery) and “Snapped” (Oxygen). Land is passing on the rewards of his commercial success through his support of the College of Communication and Information at the University of Tennessee, establishing the Land Family Communications Endowed Scholarship and providing funding for the Land CCI Ambassadors Program. The Lands are strong supporters of the Knoxville Museum of Art, and other civic groups including the YWCA, Knox Heritage, Ijams, and St Jude Hospital. Land is married to another Knoxvillian, Nancy Jones. The Lands live in West Knoxville and have two children: Lauren Hall, a graduate of Indiana University, living in Knoxville with a new daughter Caroline; and son Harrison, a graduate of the University of Mississippi, lives in NYC running the Development Department for Jupiter. His sister, Frieda, now lives in Atlanta. These outstanding alumni will be honored at the 12th Annual “Wall of Fame” Breakfast to be held on Saturday, November 2 at 9 a.m. at Central Commons, Central High School, 5321 Jacksboro Pike. The event will feature a video production of interviews with the honorees and will highlight the above graduates whose accomplishments and values demonstrate the achievements of past graduates and the potential of Central’s future graduates. Tickets are $20.00 per person and may be purchased in person at the school office, or by contacting Larry Smith at 922-5433 or Courtney Shea at courtshea@aol.com.